The Rubbermaid FG9T6600BLA utility cart has a 500-pound capacity spread across its two shelves. With lips around their perimeters, the shelves keep items in place during transport. Integrated tool hooks and an accessory caddy hold small items while making sure they are accessible and organized. Moving the cart is simple with casters and an ergonomically designed, flat handle. 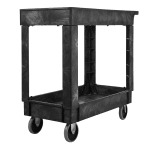 Constructed to withstand high-volume applications, the cart resists denting, peeling, and chipping. More information on utility carts is available in the carts buying guide. "Product was delivered quickly and exactly as described."